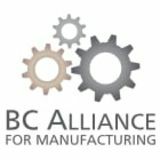 The BC Alliance for Manufacturing is pleased to announce the launch of the 2018 Scholarship program. The goal is to encourage more youth to pursue careers in manufacturing so that our province can build a strong economy. In the Summer of 2018, the Alliance will issue two scholarships – one for children of those currently employed in manufacturing and the second for youth in general who wish to pursue a career in the exciting world of manufacturing. This award is open to youth who: Have a parent currently working in BC’s diverse manufacturing value chain. Are 17 to 29 years of age. Have graduated from a Canadian High School (or equivalent) program. By September 2018, will be enrolled in a 2-year or longer post-secondary program. The post-secondary program is STEM, technical trades or another focused area of study beneficial to BC’s manufacturing industries. Are Canadian Citizens or Permanent Residents. This award is open to youth who: Are 17 to 29 years of age. Have graduated from a Canadian High School (or equivalent) program. By September 2018, will be enrolled in their first year of a 2-year or longer post-secondary program. The post-secondary program is STEM, technical trades or another focused area of study beneficial to BC’s manufacturing industries. Are Permanent Residents. Preference will be given to applicants studying at a recognized post-secondary training institution in British Columbia in the 2018/19 school year. All applicants will be offered an opportunity to participate in summer and part-time work placement programs. To apply please visit www.manufacturingbc.org/scholarships Scholarships will be awarded in the early Summer of 2018. 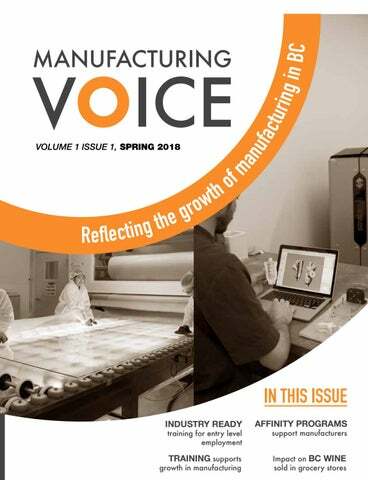 Welcome to the inaugural issue of Manufacturing Voice, a publication dedicated to the promotion of BC’s manufacturing industry. Manufacturing is one of the top contributors to the provincial economy. Our industry, your industry, is the second largest goods producer in the province directly employing just under 200,000 people. Manufacturing, representing around 8%-10% of provincial GDP is the largest contributor to business tax revenue. Available on request or visit our website. Thank You Special thanks to Ernst Vegt, Coast Imaging Arts, Comox for donating the prepress review. Harassment Can Be a Big Issue - How do you protect your company? The heart of NISP - industrial symbiosis - provides a means to improve business competitiveness and build resilient and sustainable economies through the creation of a variety of “triple bottom line” benefits. Industrial symbiosis helps businesses and organizations mirror natural eco-systems where everything has a place and function, and nothing goes to waste. Put simply, the systems-based approach of industrial symbiosis results in “one person’s surplus becoming another person’s input”. The increase in utilization improves productivity and reduces waste and costs. This proven approach has been successfully implemented around the globe. With the launch of its pilot, Canada becomes the 31st nation to use this approach to help local economies. Recognizing the potential to realize a wide range of economic and environmental benefits, all three levels of government have funded the Canadian NISP pilot. In BC, the specific funders are: •	The federal government through Western Economic Diversification; •	The BC government, through the BC Innovation Council, the BC Ministry of Agriculture and the BC Ministry of Energy; •	Metro Vancouver and the cities of New Westminster and Surrey; The NISP Canada pilot is being run as a program by Vancouver’s Light House Sustainable Building Centre. How does it work? Businesses are invited to workshops where they are able to provide details on their specific resource management challenges, suggest solutions to other participants’ capacity and waste management issues and discuss collaboration. Afterward, a detailed summary report is produced that identifies participants’ resource “Haves” or “Wastes” (e.g., surplus heat, surplus material, surplus production capacity, etc.) and their resource management “Wants” (e.g., desired material or other inputs, high-demand skills and labour, expertise to help solve a given challenge, etc.). The report lists all resources shared by participants with other workshop attendees along with an indication of all parties who expressed an interest in those resources. Likewise, all potential providers of materials, capacity, expertise, and so on to that particular participant are outlined in that same report. Whether it is developing new benefits for you and your staff, or evaluating and advising on existing programs, we will help you identify the perfect solution for your individual needs. With our collective membership and bargaining power we open the door to great health coverage for your valuable team. Harassment Can Be a Big Issue Many companies do not have the luxury of having a department or even an individual dedicated exclusively to human resources. Therefore it is difficult to stay on top of all the rules and regulations that may apply. As an additional service to the members of the BC Alliance for Manufacturing member associations, the Alliance is offering the fee-based services of a Certified Human Resources Professional who can assist. You can find out more about this service at HR@manufacturingbc.org. Our HR professional is also providing regular updates and columns on topical human resource subjects both online and in the Manufacturing Voice. During conversations with clients, we often hear similar questions. To celebrate the first issue of the Manufacturing Voice we are sharing our answer to one of the very current HR concerns. Q: There has been a good deal of media attention lately focussing on the “Me Too Movement” and in general the issue of harassment in the workplace. As a small employer, how can we ensure that we have our policies in place to handle this potential issue? A: Bullying, intimidation, humiliation or activities sexual in nature, or general harassment of any kind is simply not acceptable in any workplace situation. All employees have the right to a harassment-free workplace and as an employer, you have an obligation and responsibility to make sure no employee feels harassed in any way that affects their work performance or relationships with others in or out of work. In British Columbia, WorkSafeBC requires that employers establish procedures for handling complaints and issues in the workplace. This means that you need a stated policy that is communicated to all current and future managers, employees and contractors. The BC Alliance for Manufacturing HR professional can assist in developing this statement or can review on a fee-forservice basis your employment policy manual. attacks, aggressive or threatening gestures or comments and cyber-bullying. In today’s climate, apologies such as “I didn’t mean to be hurtful, I was trying to be funny,” are not sufficient justification. Harassment, whether intentional or not, is still inappropriate if someone ought to have reasonably known that the behaviour was going to be hurtful to a fellow employee. That being said, it is not harassment when a manager or supervisor does a performance review in a respectful manner and no inappropriate actions are requested over and above improvement of an employee’s duties. This includes discussions about work performance, workloads and deadlines, layoffs, transfers, promotions, reorganizations, work instruction, supervision or feedback, work evaluation, discipline, suspensions or terminations. Expressing differences of opinion and workplace disagreements are not a form of harassment. Asking employees for a level of job performance expectations by managers is not harassment. One of the most important tools a business can have. Almost 45 percent of workplace fines issued in BC were directly related to no proof of training or that the required training had never occurred. Entrepreneurial Spirit Alive and Well at Pacific Bolt Manufacturing Pacific Bolt Manufacturing’s focus on quality and its drive to deliver solutions for its customers has paid off dramatically. While many companies in steel manufacturing succumbed to competition from lower priced offshore production, Pacific Bolt was able to meet the challenges and even double in size. Pacific Bolt is one of the last hot bolt manufacturers in North America and one of only two in Canada. The others are in Washington state, Oregon and Illinois. Things may have turned out quite differently had it not been for the determined enthusiasm demonstrated by the owner’s son, Trevor Borland, current president and owner. “My dad didn’t really encourage me to follow in his footsteps at Pacific Bolt,” recounts Borland. “I had worked at the plant while growing up and completed my Millwright Certificate.” To expand his options, Borland then took marketing management at the British Columbia Institute of Technology (BCIT) where he completed the Entrepreneurship program option. This allowed him to gain a wide range of business skills which prepared him for a very meaningful role in his family’s business. In 2007 after he graduated, his father, Ian Borland, still thought Trevor should explore different career paths, but the younger Borland was not to be dissuaded. Since he was the boss’ son they set him up with a makeshift desk by putting a board across two filing cabinets off in the corner and basically left him there. When a request to quote came in for fasteners for Vancouver’s Canada Line SkyTrain expansion, it was thought to be too big a job to quote. However, Borland went off to his corner and quietly put all the skills and knowledge he had gained in his entrepreneurship program to work. After getting all the detailed costing and production projections down on spreadsheets he was able to prepare a detailed quote. “I probably should not have signed the quote, but I did, and sent it off to meet the deadline,” says Borland. and the pricing has also increased making them more competitive with the products manufactured in North America,” explained Borland. This is good for Canada and Pacific Bolt, providing jobs and the added economic spin-offs. For Borland, it’s hard to rationalize paying a transit tax on the newly acquired property when that area does not have an adequate transit system in place to get his employees to and from work. vision to promote the manufacturing sector in British Columbia. The Alliance coordinates multiple stakeholders to act together on priority issues impacting the province’s manufacturers. The goal is to ensure all British Columbians continue to benefit from the economic growth, high-value outputs and high-paying jobs found across all types of manufacturing sectors in the province. The Alliance provides a common platform for its members to improve economies of scale and joint-efforts in project management, training, capacity building, corporate services support and government/public relations. Meet our Member Associations Aerospace Industries Association of Canada – Pacific - Founding Member AIAC Pacific advocates for its members facilitating member participation in national and international programs designed to enhance business development, investment and global competitiveness. It promotes the presence of the BC industry on trade missions, the Canadian Aerospace Summit and the Paris and Farnborough International Air Shows. AIAC also hosts the Aerospace, Defence and Security Expo (ADSE) in Abbotsford. BC Apparel Association BC Apparel was founded in 2016 to represent companies and organizations in BC’s apparel, footwear, textile, gear and accessories industries. This group includes vertically-integrated retailers, suppliers, designers, manufacturers and educators. Apparel is one of the largest goods industries in BC with more than $4 billion in shipments. The association is helping to establish Greater Vancouver as a global centre of excellence for apparel design, quality and innovation. BC Alliance for Manufactu BC Association of Abattoirs The BC Association of Abattoirs (BCAA) was founded in 2009 to addresses the needs of BC abattoirs. It is the primary representative of the BC meat industry including craft abattoirs, federal abattoirs, wholesale and retail butchers as well as livestock producers. The BCAA is primarily focused on assisting plants to exceed regulatory requirements, liaising with key government departments and addressing the labour shortage faced in the meat industry. Meat is the largest component of BC’s food processing sector. BC Craft Brewers Guild The BC Craft Brewers Guild currently represents over 110 independently owned and operated craft breweries. The Guild’s breweries are in over 50 communities in BC. Some are small and others smaller, but they all brew flavourful local beers with passion and dedication. The mission of the Guild is to support the ongoing creation and discovery of truly great BC Craft Beer. BC Independent Distillers Association The BC Independent Distillers Association (BCIDA) represents independent craft distilleries in the province whose production does not exceed 100,000 litres of absolute alcohol per year. The association supports the production of handcrafted and artisan spirits and is committed to collectively establish and promote industry values, ethics and policies to ensure growth and innovation of the craft distilling industry. BC Wine Institute The BC Wine Institute is the authoritative voice for wine production in British Columbia, one of the premier wine growing regions of the world. The BC wine and grape industry’s $2.8 billion economic impact is a significant driver to the provincial economy supplying 12,000 full time jobs. BCWI’s membership represents 94% of total grape wine sales and 94% of total BC VQA wine sales in British Columbia. In 2017, BC’s wine industry harvested 33,000 tons of grapes and produced 22 million litres of wine. Building Supply Industry Association of BC - Founding Member For over 75 yeaers, the Building Supply Industry Association of BC (BSIABC) has promoted the industry, hosted educational events and fostered business connections. Members include manufacturers, distributors, wholesalers and retailers who sell building materials and hardware products. Over half the members are BC owned and operated companies. These operations make major economic contributions to the communities in which they are located employing more than 7,000 people in BC. Canadian Institute of Steel Construction, BC Region Founded in 1930, the Canadian Institute of Steel Construction is the industry voice offering a wide range of perspectives across the steel value chain. The CISC promotes dialogue, collaboration and commerce between industry stakeholders, advancing the benefits of steel to community consultants, builders, buyers, academia and government. The CISC represents a diverse group of steel manufacturers, fabricators and constructors, engineers and architects, owners and developers and educators/students. sector encompassing the plastic value chain (raw materials and resins; plastic products manufacturing, machinery, moulds, recyclers and brand owners). Electro-Federation Canada - Founding Member Electro-Federation Canada (EFC) is a national, not-for-profit industry association. EFC represents over 200 member companies that manufacture, distribute, market and sell a wide range of electrical products, contributing over $10B to the Canadian economy and employing approx. 40,000 workers in more than 1,200 facilities across the country. EFC members manufacture and distribute various electrical products, including distribution equipment, industrial controls, lighting, motors and generators, transformers, wire and cable, wiring supplies and electric heating. Excellence in Manufacturing Consortium Excellence in Manufacturing Consortium (EMC) is a unique not-for-profit organization, dedicated to helping manufacturers become more competitive in Canada and around the world. It is Canada’s largest manufacturing consortium responsible for contributing significant knowledge, expertise and resources towards the success of over 13,000 active consortium and online members, in every province and territory. EMC communicates with a total audience of over 40,000 manufacturing employers with 600,000 manufacturing employees. Fenestration Association of BC The Fenestration Association of BC (FEN-BC) is a nonprofit trade association representing the interests of businesses engaged in the fenestration industry in BC, and other interested parties. Formed by the merger of the Glazing Contractors Association of BC (GCABC) and the Window and Door Manufacturers Association of BC (WDMA-BC), FEN-BC represents all parties engaged in the commercial and residential sectors of the fenestration industry. Their mission is the promotion and education of Western Canada’s fenestration industry. Metals Service Center Institute - Founding Member MSCI’s mission is to promote the profitability and health of the metals industry and its role in the North American value chain. It offers high-quality industry information, strong networking opportunities, executive education and development training programs and metals-oriented public policy and advocacy programs. MSCI’s focus and investment is best summarized by NEAR: Networking, Education, Advocacy and Research. BC VQA Wine-In-Grocery Stores — a Positive Move BC VQA Wine sales in BC have increased by 2.9% or 455,600 cases since March 2014, due in part, to additional sales in grocery stores along with substantial increases in overall sales through other channels. In 2017 of the 668,000 cases sold through BC VQA winein-grocery stores, 46% were from small wineries (6,500 cases/year) supporting family farms and businesses, invalidating large winery (17%) dominance worries. “One of the early concerns about offering wines for sale in grocery stores proved to be unfounded,” added Miles Prodan, President/CEO, BC Wine Institute. “Since moving into grocery, the average retail price has increased by 13% to $21.04 – clearly refuting ‘race to the bottom’ fears.” BC’s new Liquor Control and Licensing Act came into force on January 23, 2017, incorporating the legislative changes necessary to implement some of the 73 recommendations made as part of the Province’s 2013 Liquor Policy Review. Grocery store sales would likely increase more if grocery store chains, with multiple locations, did not require separate licensing to sell BC wines in each individual store. In addition to the grocery store sales, BC VQA litre sales increased in BC Liquor Stores where sales were up 42% or 103,000 cases to 3.1 million litres/year. BC private liquor store sales also increased by 35% or 82,500 cases to 2.85 million litres/year. Individual wineries continue to attract visitors by offering tastings, tours and some on-site bistros and restaurants. Since March 2014, BC winery sales are up 43% or 127,000 cases to 3.8 million litres/year. Graduating MPW class, ready for entry level manufacturing positions. Program Changed His Life When Ryan O’Reilly answered an ad from Craigslist last year, he didn’t know what a positive influence it would have on his life. That was the day he joined one of the first cohorts of the Manufacturing Production Worker (MPW) training program offered by the BC Alliance for Manufacturing. After graduating from high school in 2009, O’Reilly didn’t really have a career goal in mind and moved through a number of entry level positions in retail and the restaurant industry before he decided he needed something different. His search brought him to the (MPW) program established to provide skills and experiences to prepare students for positions in manufacturing. True Calling: Brewmaster At True Calling,we encourage people to find their passion by helping them to change their perspectives about what’s possible. We help people explore their options and to make better decisions — to help not only their success but also their self-fulfillment. Through short films and written interviews, the company reveals real stories of people who have gone through that journey of exploration—failures, wins, hard work and experiences—to find what makes them happy. Budget — Mixed Bag for Industry It’s that time of year again when governments make their budget announcements in Victoria and Ottawa. As a manufacturing community, our businesses hold out hope for something to encourage manufacturers to keep their doors open. Unfortunately, both the federal and provincial budgets had mixed news for business with limited targeted initiatives to encourage growth. land and pathways to improve technology adoption and productivity. Federal Budget Has a Diamond in the Rough The Trudeau federal budget was also lackluster in terms of initiatives to grow the economy, increase the number of skilled workers and strengthen productivity. With has found his passion in an industry hopping with profit: craft beer accounts for 20% of BC’s beer market share. The $205 million revenue generated in 2014 is an 86% increase from 2010, making the beer market a rapidly growing and innovative sector. ship building and power generation, to organic meat sourcing and natural skin care products. As the company gains momentum, it is becoming an essential component to attract potential hires and to create aspirations for people looking for their true calling. It’s stories like With’s that show people what else they can do with their experience and education, beyond traditional paths. By using the power of such stories, True Calling is able to change perceptions of careers and create a new awareness about opportunities. In that spirit, True Calling Canada is working with the BC Alliance for Manufacturing to help attract more youth to the diverse range of careers in all facets of manufacturing. Each dollar of supercluster funding will be matched by $2.40 from industry. This outstanding investment will transform manufacturing competitiveness and create new opportunities for firms at all stages of the manufacturing value chain, strengthen manufacturing in communities, and grow employment among the hundreds of thousands of workers employed in key industry segments like food and beverage production, wood products, apparel, steel and aluminium, electronics, PrestonMobility press ready.pdf 1 18/3/27 下午5:37 aerospace and marine, to name but a few. An innovative training program to combat a shortage of skilled and semi-skilled workers in the meat processing products sector in BC is a primary focus for the BC Association of Abattoirs (BCAA). It is the first of its kind because it focuses on both the potential students and industry needs. Advanced Education, Skills and Training, the BCAA has developed a unique and flexible program for people interested in becoming involved in the industry. There are no bricks and mortar and the program is able to be located in any area where meat processing skills are needed. ment and floor care appliances. The team collaborated with TTI to develop user experience studies, shaping how we design products. Mohr says 3D printing is less about becoming part of the large scale manufacturing process and more about the design ideation process in the development of new and better products or parts. “For designers it is a valuable tool.” They can take their work in CAD, print the piece to test how it actually works within about five hours.” Mohr continues, “instead of designing a piece and sending it away to be made, then finding it doesn’t work or work as efficiently as it should, with 3D printing a company can do one piece at a time and then try it out and easily make modifications. Using 3D printing saves a good deal of time and money. Logan Mohr, Material Matters Research Centre demonstrates the process for designing and making prototype tooling with 3D printing. Let’s manufacture BC’s future together As an industry stakeholder, we know you already have a passion for manufacturing. We invite you to add your voice to those of the associations and industry leaders who are advocating on your behalf. The common goal is to help create the conditions that make manufacturing more competitive. Number of Manufacturing facilities in BC. This requires engaging with key influencers and policy makers at all levels of government and building allies within the business community. It also means sharing the importance of manufacturing to the BC economy with the media and the general public. As ambassadors for the industry please use the graphics on this page to remind people how large our industry is, how significant the economic contributions are from manufacturing and how important your products are in just about every aspect of our daily lives. The number of people employed by maufacturing industry in BC directly in 2016. Government and industry can collaborate to build prosperity. Let’s manufacture BC’s future together! Adding information to your website. •	Sharing information with your employees about how their jobs and efforts are contributing to the BC economy. Employees who understand their role in the overall picture of the manufacturing industry can be a powerful asset for manufacturing. •	Sharing this information on manufacturing in BC at your business meetings. goods producing sector (after construction) . Each year manufacturers export more than $20 B, representing 63% of the province’s exports ($30 B). Manufacturers pay 30% of business taxes to government.